Allergy Testing at Lytle Veterinary Clinic- Allergy ACTT Testing, Initial, and Refills. 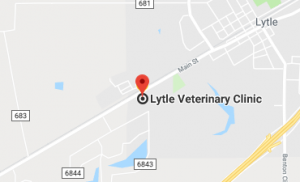 Allergy testing can be done at Lytle Veterinary Clinic. Allergy Testing at Lytle Veterinary Clinic. Every allergy case is unique. There is no magic pill for itchy pets. There are many options for short-term solutions to help control allergic disease signs in your patients. Immunomodulatory drugs target proteins with more wide-reaching impacts upon the body than just the causation of itch. No drug can cure chronic allergic disease; it can only alleviate symptoms for a short time Use short-term solutions to provide relief, in conjunction with all natural immunotherapy. Each year millions of Americans suffer from allergy, a type of immune hypersensitivity which includes asthma, rhinitis and food allergy. More Americans than ever are suffering from allergies. The occurrence of allergies in our pets mirrors that which occurs in human allergies, and incidence is rising each year. 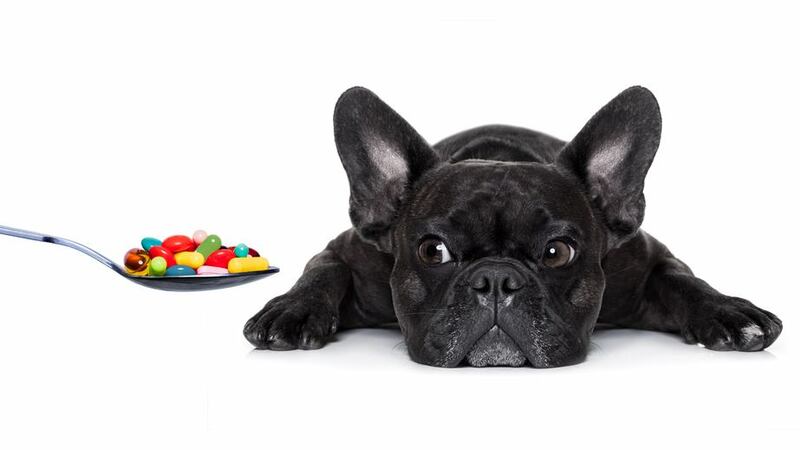 Animals, just like people, can suffer allergic reactions to a wide variety of environmental substances, or allergens. Research has shown that immunologic mechanisms underlying allergy in our companion animals (dogs, cats and horses) are essentially the same as in humans. Allergies are an inherited trait and lifelong disease, the result of an immune system imbalance. The tendency to develop allergies is a dominant genetic trait. When one parent is allergic, there’s an increased likelihood that his or her offspring will also be allergic. Allergies are not curable, but they can be managed with immunotherapy treatment, medications that treat symptoms and avoidance. If neither parent is allergic, the chance of developing allergies in offspring is about 15%. If one parent is allergic, the risk increases to 30%. If both parents are allergic, the risk is greater than 60%. Steroid therapy is a successful short-term solution, but prolonged use can have serious side effects. Steroids reduce itching by reducing inflammation. Unfortunately, they also affect every organ in the body. These include drugs that target the immune system in various ways to stop the patient from itching. They are classified as immunosuppressant or immunomodulatory drugs and biologic therapies, examples are drugs such as Atopica, Apoquel® or Cytopoint™. These are all short-term therapies that affect several systems in the body. 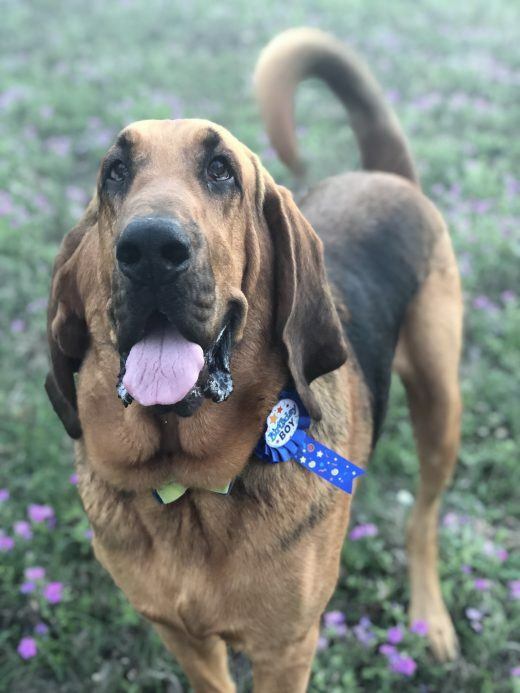 Monoclonal antibody-based biologic therapy is the newest tool to become available for fast-acting itch relief in atopic dogs. Cytopoint™ is an engineered antibody given monthly to control the itch. Cytopoint™ targets and neutralizes a specific protein that helps to send itch signals from the site of allergic inflammation in the skin, through the nervous system to the brain. For more in-depth information click on the link below. Both immunomodulatory drugs and biologic therapy target proteins with more wide-reaching impacts upon the body than just the cause of itching.Allergen-specific immunotherapy remains the safest and most well-characterized method for the treatment of allergy symptoms, by treating the underlying cause of allergic disease. 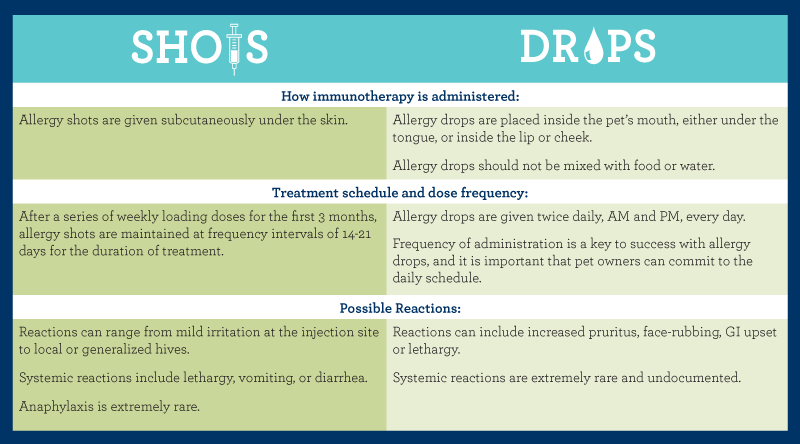 ACTT offers allergy shots and drops for their pet allergy treatment plans. Allergy shots have been used in human and veterinary medicine with great success for several decades. 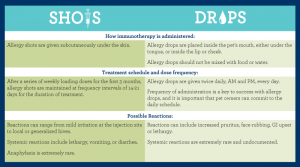 Allergy drops are an ideal treatment option for owners or pets who are needle-averse, or for patients who have a history of intolerance to allergy injections; however, the frequency of administration is a key to success with allergy drops and it is important that pet owners can commit to the daily schedule. Every allergy case is unique, and all pets respond to differently to immunotherapy. For this reason, our customized pet allergy treatment sets are formulated for one of five different immunotherapy schedules to accommodate the needs of each allergic patient. Immunotherapy protocols are custom-formulated according to the species, breed, age, weight and clinical history of each animal. For more information on ACTT treatments click on the links below. All information was gathered from the ACTT website.